Zion Market Research has published a new report titled “Performance Management Software Market By Deployment Mode (Cloud-Based and On-Premises), By Organization Size (Large Enterprises and Small and Medium-Sized Enterprises), and By Vertical (Media and Entertainment, BFSI, IT and Telecommunications, Healthcare, Manufacturing, and Others): Global Industry Perspective, Comprehensive Analysis, and Forecast, 2018–2026”. 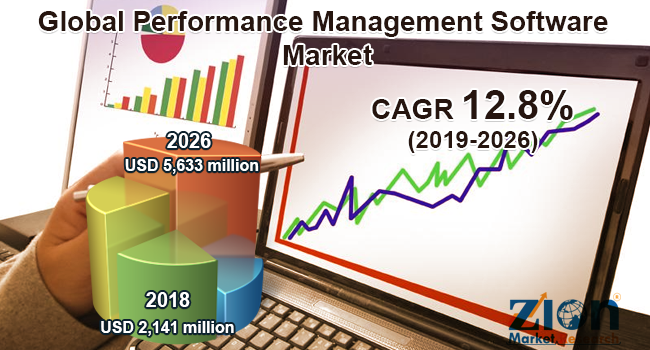 According to the report, the global performance management software market was valued approximately USD 2,141 in 2018 and is expected to generate USD 5,633 million by 2026, at a CAGR of around 12.8% between 2019 and 2026. By region, North America held a major revenue share of the global performance management software market in 2018. This can be attributed to the presence of major industries in the region that fuel the demand for performance management software. Moreover, the early adoption of innovative software and solutions in the region is expected to further drive the region’s performance management software market over the forecast time period. The Asia Pacific is predicted to grow at the highest rate in the future, owing to the increasing demand for effective and unbiased performance appraisal system by the regional organizations.